Town of Rhenish Prussia, in the district of Düsseldorf. Like most Rhenish towns, Xanten had a Jewish community in early medieval times. Two massacres of Jews occurred during the First Crusade (June 1 and 27, 1096). On the latter occasion some Jews committed suicide in order to escape the fury of the Crusaders (Aronius, "Regesten," p. 89, No. 188; p. 92, No. 195). In 1187 the martyrs of Neuss were brought to Xanten to be buried by the side of those martyred in 1096 (ib. p. 144, No. 322). In the latter part of the nineteenth century the attention of the Jewish world was attracted to the small congregation of Xanten by a blood accusation. On June 29, 1891, John Hegemann, the five-year-old son of a local cabinetmaker, was found dead in a neighbor's barn, with his throat cut from ear to ear. Anti-Semitic agitation connected the Jewish butcher and former shoḥeṭ Adolf Buschoff with this crime; and the local priest Bresser lent support to this rumor by publishing articles on ritual murder in the "Bote für Stadt und Land," of which he was the editor. The agitation in the anti-Semitic press, as well as at anti-Semitic meetings, where it was insinuated that the Jews had bribed or intimidated the authorities in order to prevent the discovery of the truth, compelled the government to arrest Buschoff and his family (Oct. 14, 1891). The evidence against the man, who had always borne a good reputation, was so flimsy, however, that he was discharged (Dec. 20). 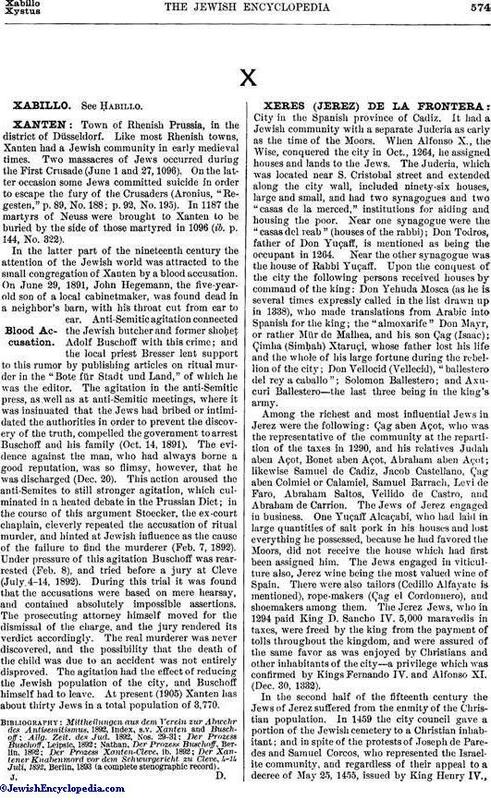 This action aroused the anti-Semites to still stronger agitation, which culminated in a heated debate in the Prussian Diet; in the course of this argument Stoecker, the ex-court chaplain, cleverly repeated the accusation of ritual murder, and hinted at Jewish influence as the cause of the failure to find the murderer (Feb. 7, 1892). Under pressure of this agitation Buschoff was rearrested (Feb. 8), and tried before a jury at Cleve (July 4-14, 1892). During this trial it was found that the accusations were based on mere hearsay, and contained absolutely impossible assertions. The prosecuting attorney himself moved for the dismissal of the charge, and the jury rendered its verdict accordingly. The real murderer was never discovered, and the possibility that the death of the child was due to an accident was not entirely disproved. The agitation had the effect of reducing the Jewish population of the city, and Buschoff himself had to leave. At present (1905) Xanten has about thirty Jews in a total population of 3,770. Der Xantener Knabenmord vor dem Schwurgericht zu Cleve, 4-14 Juli, 1892, Berlin, 1893 (a complete stenographic record).